As a plugged-in reader notes, the six bedroom home at 1945 Franklin is scheduled to hit the courthouse steps on September 16 with $5,684,086 owed as of August 2009. Purchased in June of 2005 for $3,000,000 with a $2,350,000 first and a $790,000 construction loan second (yes, that’s over 100% LTV), the property appears to have been refinanced in December 2006. UPDATE: The $5,684,086 balance due was as of the Notice of Trustee Sale (NOTS) filing in August 2009 while the refinancing was in September 2006 in the amount of $5,000,000. In December of 2006 a home equity line of credit was opened with a $500,000 limit. And according to a couple of plugged-in readers, that infamous Excalibur seen about town with “ACQUIRE” license plates currently resides in the garage (alongside a Range Rover), apparently “BorrowSpendDefault” didn’t have the same ring to it. Here’s a little pent-up supply [around the corner from 1800 Gough] (and perhaps some future competition?). The home at 1945 Franklin Street appears to have been purchased for $3 million in 2005. In Dec. 2006 the home was refied with WaMu (RealtyTrac is showing $5+million owed). A NOTS was filed on Aug. 31, 2009. Owned (for now) by San Francisco’s most naked capitalist. Previous owners include Nicholas Cage, Howard Grossman, and Patricia Arquette. When Nicholas Cage owned it, it was black outside and peculiar and weird inside. That Austin business times article is so funny. Particularly that the writer sees the “naked capitalist” as proof positive of a “Creator” (as in G O D). There’s one difference between Texas and SF…. Speaking of courthouse steps, isn’t 311 Marina Blvd set to hit the steps tomorrow? …bidding was opened at $10.4 million, far less than the $35 million that Cage had tried unsuccessfully to sell the house for. There were also no takers in the courthouse sale, and in less than a minute the auction closed, with ownership reverting to the foreclosing lender—just one of six holding a total of $18 million in loans on the property. The pattern of repeated borrowing against equity is familiar to Bob Baker, sales manager of County Records Research, a Huntington Beach-based company that supplies information about foreclosure properties. I think we’ve seen this survival tactic in operation for several properties featured on socketsite in the last few years. Is that the “Pirates” place? He is driving around the Marina and Pac Heights all the time in a Excalibur looking car smoking a cigar and have “acquire” or something on the licence place. Funny looking guy. This guy must be a naked capitalist, because he hasn’t filed any permits that would align with a $790K construction loan. The only permit pulled since 1998 was in 2008 for a $5200 repair of the front stairs. 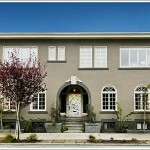 The prior agent claimed this was an over 6000 sqft 6/4.5, but the tax record says 4837 sqft as a 6/4. But yet another $4M+ extraction is incredible. Gotta wonder why anyone would pay money to live here. It’s perpetually in the shadow of the big place to the south, especially in fall/winter I’d bet it’s a cold place! @Adam, All of San Fran is cold my friend. @Mike, I always that that guy in the excalibur was some old musician or something? Eddy, I know that was a joke, but that’s a bit flippant about exposure. 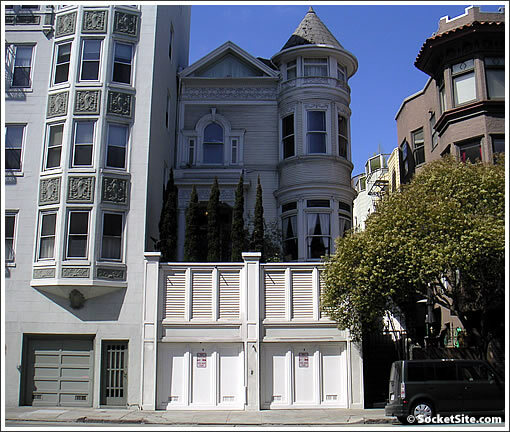 Personally, I would never buy a place that is heavily shaded in SF. If you’ve got a place that has southern exposure AND is protected from the wind, you can actually enjoy the outside in SF. @Mike and @Eddy: yep, it’s the guy in the Excalibur car smokin’ his cigars. I always thought he was an aging 80s heavy metal guy because he never leaves the house unless he’s in full regalia — big hair, leather pants, black leather boots, black leather jacket. Not my vision of a capitalist at all. Sometimes I walk my dog early in the morning on the weekends and he is just pulling into his driveway, presumably looking like he’s been out all night. His wife also fits the part of aging rocker’s spouse with big blonde hair that’s also a little out of date. I often see her driving their uniformed daughter to school in her Range Rover. UPDATE: The $5,684,086 balance due was as of the Notice of Trustee Sale (NOTS) filing in August 2009, the refinancing was in September 2006 in the amount of $5,000,000. In December 2006 a home equity line of credit was opened with a $500,000 limit. The good news for the bank is that only $2.35M at most could be non-recourse. I don’t believe a construction loan counts as purchase money. Maybe they can attach a bunch of his ACQUIREd stuff. Wonder if the “Dragon Fireplace” is still breathing a warm fire into the living room? @rolfsf: Anton LaVey’s black house was located on California at about 24th Ave. 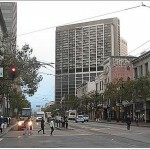 It has since been torn down and replaced with condos. Well, this is exciting; it looks like they’re suing to stop the foreclosure. As Neil likes to say… Got popcorn? I thought Nicholas Cage’s wife was Asian?? From the trial record, it looks like they lost as to Chase. Chase demurred and the demurrer was sustained. This is the state court equivalent to a motion to dismiss for failure to state a claim upon which relief can be granted (12(b)(6)), i.e. they essentially had no legal case under the facts. It looks like the case is still active against the loan servicer, however. Looks like 311 Marina got another routine 1 month postponement due to the bankruptcy case. I didn’t realize this has been in some stage of foreclosure since 2006, but I just found an old thread when searching for the prior thread on 311 Marina. What’s funny is that it’s a 2006 thread about Property Shark adding SF foreclosure listings. What’s odd is that there’s a 2007 sale listed at $3.69M, but there’s no way in hell that that 2007 sale was arms-length, as Redfin points out. I wonder whether these contra foreclosure lawsuits are just a delaying tactic to obtain more “free rent” before being evicted. If the legal costs are less than what it would cost to rent during the delay, it makes financial sense. The good news for the bank is that only $2.35M at most could be non-recourse. That’s a fair point, but doesn’t it become worth it at some point? At least $2.65M is recourse for the first mortgagee. If you think you could collect more than the cost of foreclosing from this guy, it would be rational to seek a judicial foreclosure. Maybe he bought a boat, you know? When someone pisses away that much money, it’s entirely possible they have some assets. Some of these $4M+ deadbeats, like Mr. Ferrari Guy at 3346 Clay have to be worth pursuing. @Huh? — Nick Cage no longer lives in this house. Anyone old enough to recall if this is the Franklin Street manse published in Architectural Digest circa 1978/1979? EST est est est house…. I am suprised it has any bathrooms at all. Funny, I just saw the ACQUIRE guy smoking in that car outside of Nick’s Crispy Tacos. Must not be feeling so flush these days. The Acquire guy is actually a parent of [Removed by Editor].